Community Farm Expansion-New plots available! Hey everyone! We have officially expanded Sustainable Renton Community Farm! We have 10 new plots available for gardening in this season. We offer a 10’x20’ plot for just $50. This price is good for a 12 month period, so if you want to plant perennials, or try your hand at winter gardening-now is the time. The soil is great and the people are amazing. The farm is located at 11840 148th Ave NE Renton 98059 (behind Celebration Church). Feel free to stop by the garden any time and have a look around. If you are interested in gardening with us you can get a hold of us at sustainablerenton@gmail.com and we will get you started right away! Get empowered, grow your own! Posted on April 30, 2014 Author Sustainable RentonCategories Community Farm, Local Food SystemTags Community Farm, Community Gardens, Gardening, SustainabilityLeave a comment on Community Farm Expansion-New plots available! The Sustainable Renton Community Farm is expanding! We have officially been given approval from the land owners to plow and create 13 more garden plots at the community farm! There are only 4 people on the waiting list so now is your opportunity to come and be a part of the amazing community gardening that is happening. Please drop by for a gander any time. The farm is located behind Celebration Church, at 11840 148th Ave NE, Renton 98059. If you would like to arrange a meeting at the farm with the farm manager or would simply like to be placed on the waiting list for plots being made available on May 1st please contact Lara Randolph by emailing to sustainablerenton@gmail.com and she will be glad to give you a tour of the garden and what we have available. Posted on April 21, 2014 Author Sustainable RentonCategories Community Farm, Local Food SystemTags Community Farm, GardeningLeave a comment on Farm plots available! 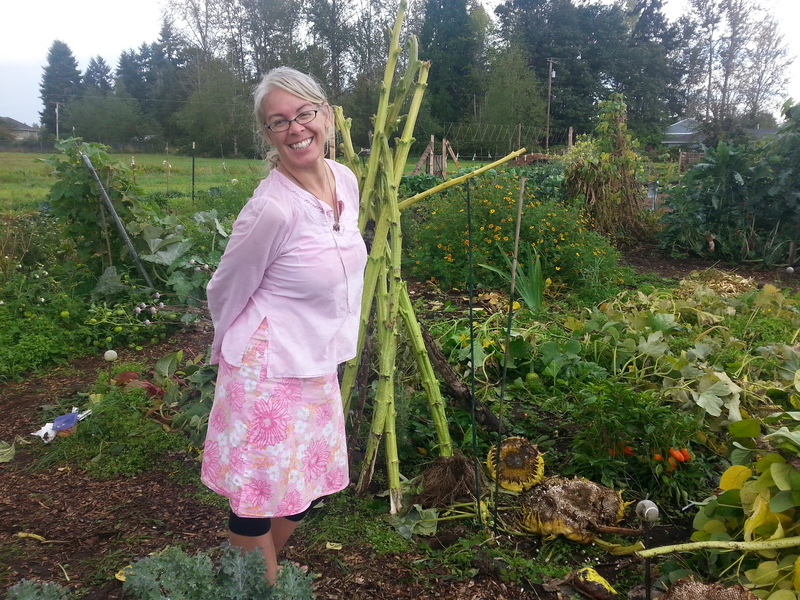 The magnificent Laura Sweaney conducted a workshop at Sustainable Renton Community Farm recently, titled How to Plant a P-Patch using Permaculture Design. This was perfect for those of us that want to incorporate permaculture techniques but have a small space to do it in. Typically, permaculture is a large scale philosophy to be utilized by the designer in vast amounts of space, but the plots available at the farm are 10’x 20’ so what is a gardener to do? Well, Laura was able to show us a beautiful design that we can use on a small scale that not only increases yields, increases water retention, increases soil health, decreases pest and disease vulnerability but also increases the overall aesthetics of an ordinary P-Patch plot. For a more detailed explanation of Permaculture principles you can go here. We began with a blank slate. Granted, the soil at this location is absolutely luscious, so we did not have to do a lot of amending. The plot was empty save for a few pea starts that were struggling to come up after our heavy rains that all but laughed in the face of our enthusiastic gardeners trying to get something in the ground in March. The first thing Laura did was to create a pathway through the space. Permaculture is not an advocate of planting in rows. The overarching idea is to mimic nature as closely as possible. For anyone who has studied nature, perhaps one description would be a sort of “ordered chaos”. The path was a curved line that ran through the patch in an s-shape leaving no further than 3’ for one’s arm to reach for harvesting, while maximizing the amount of space to grow in. She made a couple of keyhole beds that were connected by the two ends of the path. A keyhole bed is a space where the gardener can walk into the circle for harvesting. This creates a microclimate where the sun comes in from the south at the beginning of our path and saturates the circle where we have some of our more heat loving plants. We then began to plant the starts and seeds that we had available to us. We planted lettuce, kale, cabbage, chard, collards, leeks, chives, onion sets, strawberries, carrots, parsnips, rosemary, thyme, lavender and cilantro. 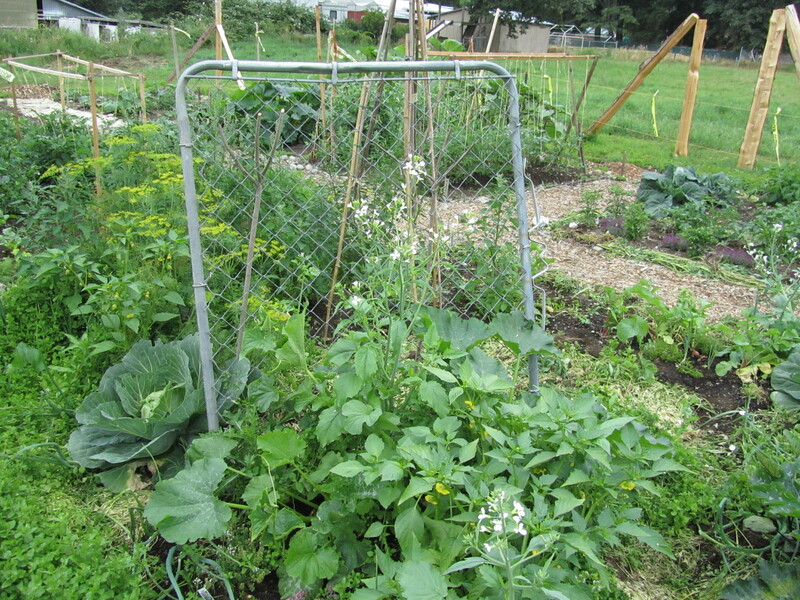 We placed a bean teepee in the SE corner of the plot with a cabbage in the middle so that as the heat comes on us the cabbage will be protected inside the bean teepee. This structure will be ready for us to plant beans next month. Also we placed a structure for our indeterminate tomatoes to climb on when the time is right for planting. This should prove to be an amazing site when the summer is in full swing. Permaculture comes from joining the ideas of permanence and agriculture or permanence and culture. As Laura stated, what we are doing at a P-Patch is really about permanent culture. We are building connections with our community to create resilience within our culture, within our city. This plot is on display as our Permaculture garden plot. So, if you are in the area, stop by and take a look at what we have done to this plot. Up at the farm you will find that there are beautiful things growing, people laughing and making connections. Come and join us. 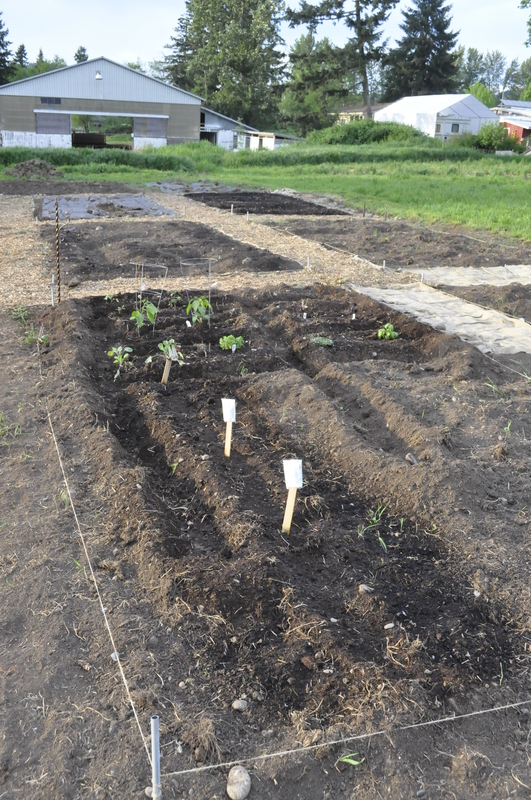 We do have a waiting list for plots coming at the beginning of May, however, there is no need to have a garden plot to come by and hang out for a while. If no one is there, you will be amazed at the peacefulness available. If someone is there you can introduce yourself and make a friend. Bring your lunch, have a picnic with your family. There is a play structure and a sand box for the kids. Hello readers! Here is the next installment of getting to know the gardeners up at Sustainable Renton Community Farm. Laura has been an amazing resource throughout our process of getting the gardens at the farm started. She is a wealth of knowledge on so many topics of sustainability. She led our first official workshop at the farm site, and has been utilized countless times for consultation throughout this first growing season. We are blessed to have her presence. How did you become interested in Sustainable Renton Community Farm? I have been an active member of Sustainable West Seattle and was delighted to find a local SCALLOPS group in my area. What do you like most about the SRCF? The soil is AMAZING. Even weeding is a joy when you have such pristine soil to play in. What kinds of things are you growing in your garden? The hot-weather plants I included are going strong this year: jalapeno, banana and green bell peppers, cucumbers (so many cukes! ), radishes (especially the seed pods), dill, chives, cilantro/coriander, epazote, chamomile for tea, yellow and Italian zucchini, cabbages, collards, scarlet runner beans (when the deer don’t beat me to them), onions and tomatoes. Not many tomatoes. Late blight got almost my entire crop – I lost about 120# of tomatoes. But I harvested 40# of tomatillos, so that makes up for it a little. What is your favorite thing to grow and why? That’s like asking “which of your children do you love the most”. Impossible to answer. Japanese cucumbers are fun – they yield over a long period and do well in cooler weather. This year they didn’t even really start bearing till it got cooler – early September. The jalapenos were a huge surprise this year – I got two BIG bowls full off of 6 plants. The collards keep trying to take over the world – that’s a lot of fun to see, too. Do you employ a particular gardening philosophy? If so, what it is it and why? 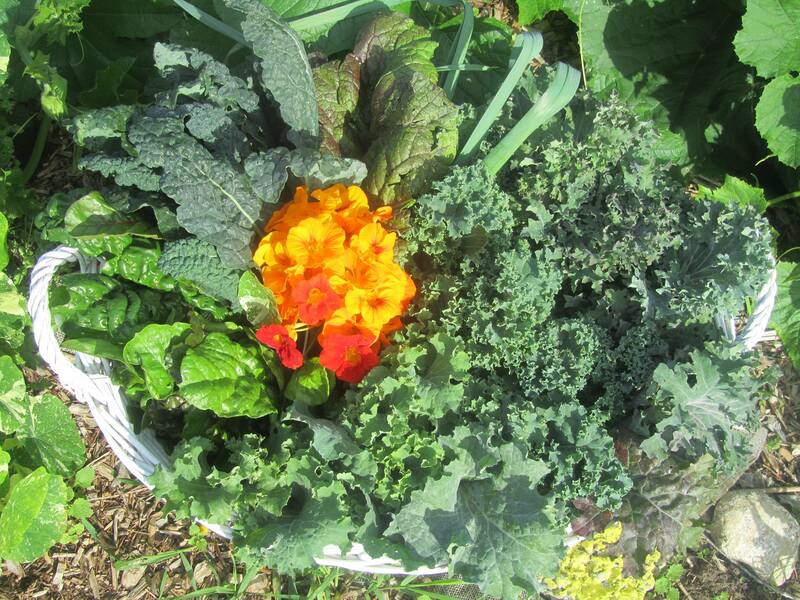 I grow using the principle of polyculture – many things growing together. No rigid rows or single-crop straight lines. So I have edibles, ornamentals, tea plants and herbs all in a riot of production. It confuses pests and minimizes disease, except in my monoculture of tomatoes. Once again, the hazards of monoculture become apparent, even in the small scale of our community garden. If you have one diseased plant, it easily becomes MANY diseased plants. Socially Conscious Gourmet Dinner for 14! Those of you that enjoy good food, good wine, good conversation, and supporting a good cause should LOVE this! 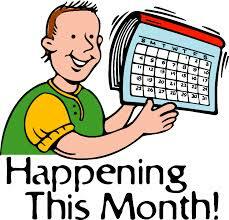 The Renton Community Foundation is having their Annual Online Auction *right now*. This year’s theme is For the Love of Community. All proceeds from the auction go the the Foundation to help them meet the ever-increasing need for services in the Puget Sound area. One of the auction items is a Socially Conscious Gourmet Dinner for 14. This dinner features the culinary talents of the Red House Beer, Wine Shoppe and Tapas Bar kitchen, wines from local vintners Cedar River Cellars, and produce from the Sustainable Renton Community Farm. This wonderful evening is being auctioned for 14 people, who will enjoy a 4-course meal paired with wines. The evening will also highlight the exciting partnerships happening in our community in this emerging ‘farm to table’ sustainable economy. What a great way to support local charities, enjoy delicious food and wine, and to learn about a sustainable local food system in action. You can find out all the details and bid here. Posted on October 15, 2013 Author Sustainable RentonCategories Community Farm, Local Food SystemTags Cedar River Cellars, Community Farm, Red House, Renton Community FoundationLeave a comment on Socially Conscious Gourmet Dinner for 14! Hello everyone! 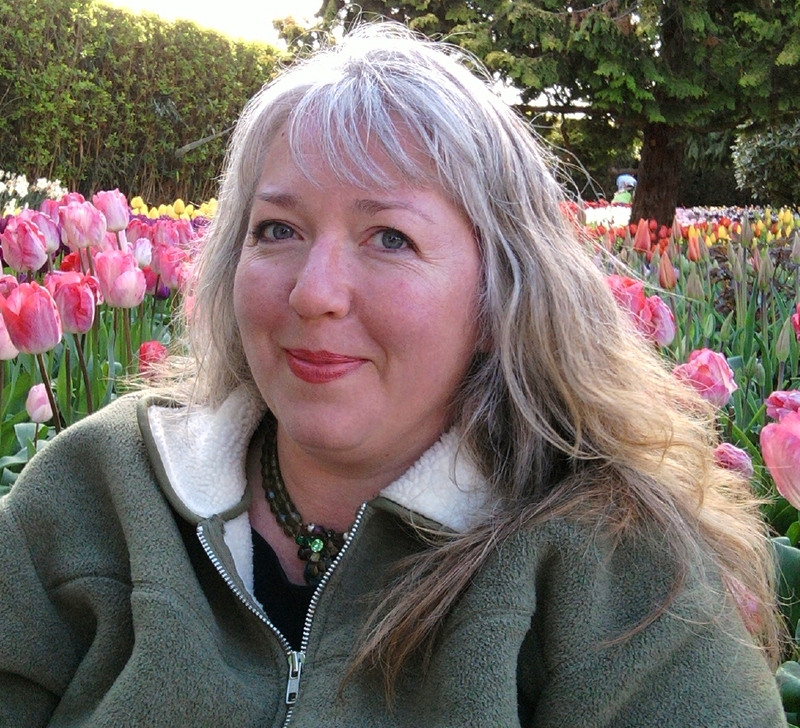 This week the interview comes from a gardener who tried her hand at gardening at this capacity for the very first time. How did you become interested in Sustainable Renton Community Farm? I’ve been wanting to try gardening for a long time but haven’t had the space for it. It was a big YES! moment when Lara asked if I was interested. What do you like most about the SRCF? I love the peaceful feeling that comes over me when surrounded by such lush and beautiful new life and growth. What kinds of things are you growing in your garden? This season we grew giant sunflowers, 3 kinds of bush beans, spinach, broccoli, radishes, potatoes, bell peppers, strawberries, beets, amaranth, marigolds, sugar pumpkins, cucumbers, rosemary, calendula and carrots. What is your favorite thing to grow and why? hmmm…. the pumpkins were CRAZY fun to watch and try to manage as they tried to take over our entire plot. Food wise, I loved having the ability to wander out and pick some dinner off of our broccoli and spinach plants. Do you employ a particular gardening philosophy? If so, what it is it and why? Sew seeds, and water, weed, love on obsessively, until I get busy and then ignore guiltily. Occasionally throw some rabbit poop around to feed. It has been such a wonderful experience to share in everyone’s enthusiasm and wonder at how miraculously things grow. The seed pod is genuinely one of nature’s many abundant miracles that provide us with everything we need to live wholesome, healthy lives. And to think, it didn’t come from a drive-thru window! Who knew? A lot of people know that, but in a busy world that keeps us from ourselves it is easy to forget that the earth provides us with everything we need. Sustainable Renton Community Farm is a facilitator of remembering what a wonderful gift the earth is. Interview conducted by Lara Randolph, Sustainable Renton Community Farm Manager.